The image above was the first painting that I can really remember having paid any attention to. It was a figure in an encyclopedia of steam engines that I had when I was much younger and I didn’t get it at all. It took me a long time to realize that what I was looking at was a steam engine, a Great Western train crossing a viaduct, even though there was accompanying text that described the image. I didn’t get it at all. It didn’t look like a steam engine, a train or anything that I’d ever seen for that matter. That of course was the point. It wasn’t supposed to look like something it was an attempt to capture a mood, a sensation, a feeling. Looking at ‘Steam, Speed, Rain’ now I would say that Turner nailed it perfectly. At the time Turner made this painting in 1844 he would have been around 69, his position in the art community firmly established he was well positioned to push the boundaries of what was accepted as the norm. I suspect that many of the people at the time didn’t appreciate what he was trying to achieve and ridiculed him for his efforts. Even so, he pursued the development of this style of removing precise forms from his work leaving color and light to give a sense of the mood he was trying to evoke for the last two decades of his career. Turner was one of the first artists to ensure that his work would be preserved following his death and so there is a rich archive of material from sketchbooks to watercolors and oils to study. I doubt how he got from the work that got him elected to the Royal Academy at the ripe old age of 26 to that of his later years will be clear from a study of the 40,000 or so works that he left behind. This looks like a good year for Turner fans. 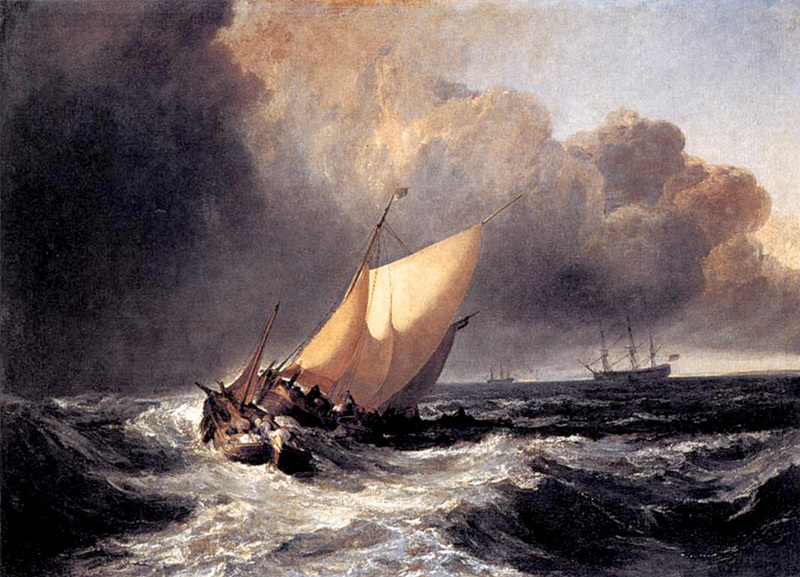 There is an exhibition of his sea pictures ‘Turner and the Sea‘ now showing at the Peabody Essex Museum in Salem.